This post could have been called, “Andrew Keys broke up my marriage.” It was a long marriage, too; 25 years. Of course, my partner was prickly: a climbing rose (Rosa ‘New Dawn’). And the break-up is only starting, thanks to Keys’ book, Why Grow That When You Can Grow This? 255 Extraordinary Alternatives to Everyday Problem Plants. If you’ve ever found yourself with too much plant, not enough time/energy/water/space/(your complaint here) – or if you simply want to avoid the preceding – this book is for you. 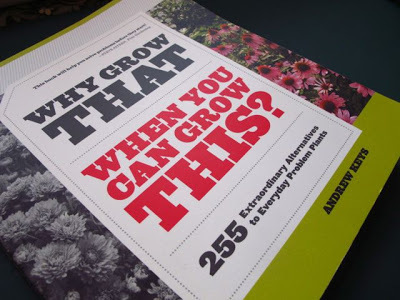 Most of its 300+ pages contain alternatives, covering a range of hardiness zones, for over 80 “everyday problem plants.” Stick around, and I’ll tell you how to win a copy. Keys is a garden designer, garden writer, podcaster for Fine Gardening magazine and all-round knowledgeable plant guy. 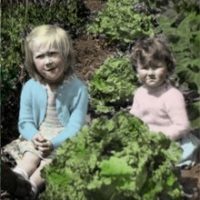 His blog Garden Smackdown is everything you’d expect from the name. He’s fun to read, making his book informative and entertaining. As an experienced gardener, I found plenty of unexpected plant alternatives. For the invasive Japanese or Hall’s honeysuckle (Lonicera japonica), for example, he suggests two honeysuckle cousins I’d never heard of: grape honeysuckle L. reticulata ‘Kintzley’s Ghost’ and coral honeysuckle L. sempervirens ‘Major Wheeler’. Although, like these, Keys’ alternative plants aren’t always one-to-one substitutions – these two lack the bad guy’s alluring fragrance – they push the envelope to get you looking not only for new plants but for better versions of the ones you have. 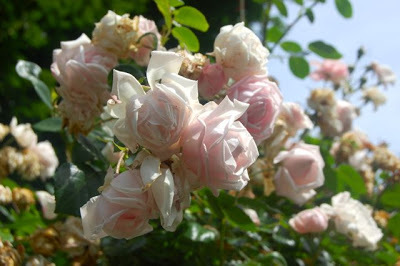 I love you, but I hate you, Rosa ‘New Dawn’. Bye bye, brown flowers? A few suggestions aren’t perfect. In Toronto, it isn’t sustainable to replace the bane of our urban forest, Norway maple (Acer platanoides), with either sugar maple (A. saccharum) or red maple (A. rubrum) – Keys’ first two options. Neither is fond of pollution or of soil compaction, so it isn’t a great urban tree. Better alternatives for us might be Freeman maple (A. x freemanii) for fall colour or hackberry (Celtis occidentalis) for shade. You need to do your own research before installing any plant in your garden. But these are quibbles, Sybil. The key to Keys is the way he nudges us out of our box, and gets us thinking about, well, about breaking up a long-term relationship with a plant diva who’s outgrown her welcome in the Microgarden. Why grow that, when I can grow something better? Yeah, life is too short. My thinking cap is on, Rosa, so best start packing. A bonus in the book is the excellent and easily digested intro chapter on sustainable plant choice and planting design. Commit it to memory. This is “teach a man to fish” stuff that will hold its value, no matter which new plant alternatives come along. I also appreciate the inclusion of metric conversions and Canadian mail-order plant sources. Thanks for that, Andrew! We Northoftheborderians salute you. Want a copy of Why Grow That When You Can Grow This? for your favourite gardener (maybe that’s you)? Leave a comment telling us your most-hated garden diva or your inspired plant alternative. We’ll put all your names in a garden hat, and draw a winner on Sunday. Congratulations, Bernadette. You're our winner! The book has a few alternatives for rhodos, so I hope your luck holds. My plant alternatives are moving to natives….this year my ohhh and ahhhh plant is the oakleaf hydrangea. There are still bright red leaves hanging on….the fall color outshines the blooms, almost. 🙂 I love reds in the fall garden, so the hydrangea and Iteas take a good amount of my garden. I love the oakleaf hydrangea, and now there's even compact versions of it for smaller gardens. Two have the great names 'Munchkin' and 'Ruby Slippers' — the first is about half the size of the second; but the second has showier, pinker flowers. I laugh when I read this, Veronica, because Houttuynia is one of many "invasive" plants I've managed to kill in my dry-shade garden. Another is, wait for it, goutweed. But, generally, Houttuynia is thuglike, albeit pretty. I've seen it well used in containers, usually treated as an annual. Silphium perfoliatum (Cup Plant)was my mistake. First year was fine, second year a little more agressive – this year it grew up and up and up – we could see the top from the second floor window. To make matters worse it also grew out so what was once a small contained area has now taken over an extra two feet with babies popping up all over but….at least it's native. Uh oh, Linda, a neighbour has just found cup plant volunteering in his garden. He asked me to ID it for him, but I hadn't heard of its aggressive ways. Will tip him off before it's too late. Thanks! This is going to be a little out of the box but my most hated garden diva is the SOIL in the small garden patch beneath my mother's front window!! We've tried mulching, composting, even replacing the top 12" with new soil but no plant seems to thrive there! We've experimented with putting the same plant in that location and elsewhere in the garden and that patch will always end up with what looks like the runt of the litter! !